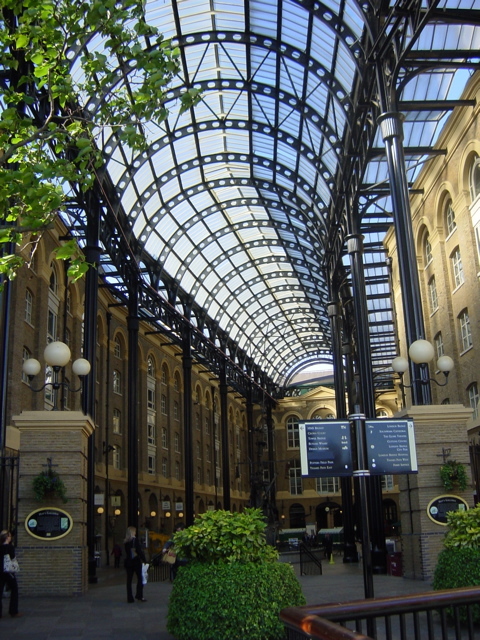 It was a nice sunny morning, so I walked to work, which I've done a couple of times previously since we moved in here. It's about 4.5 miles, and by my estimation the route passes 13.7% of the cultural heritage of the English-speaking world. 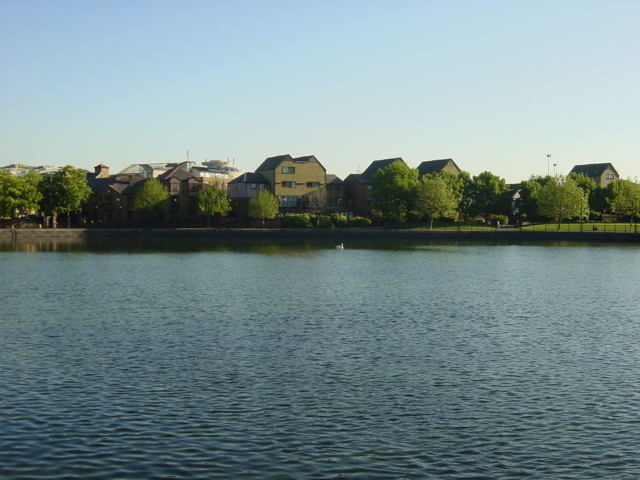 Here is the view across the disused dock at the start of my trip. 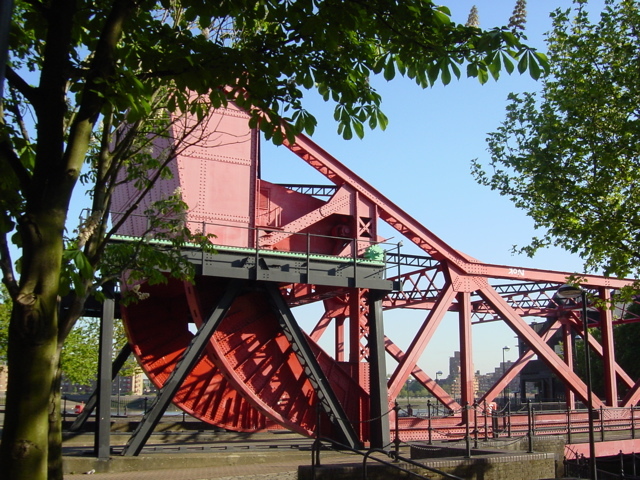 There is a lifting bridge across the bottom of the channel from the canal into the Thames, which is a bit pointless these days as the other end of the channel is blocked off by concrete. 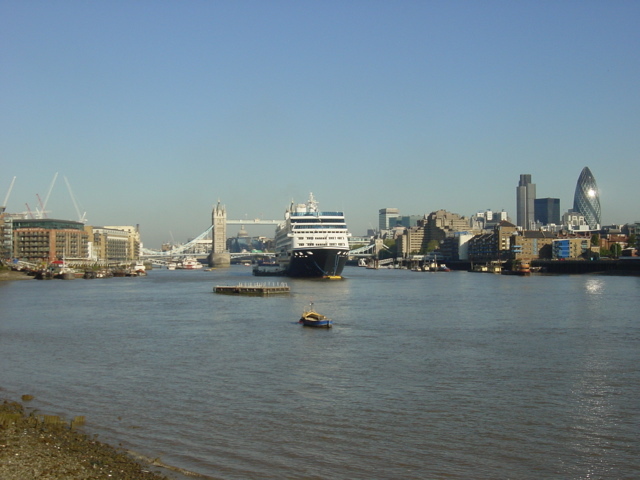 This is the view across the Thames from the point where I turned left to go upriver. The observant will notice that this entry cannot have a no-shag disclaimer. 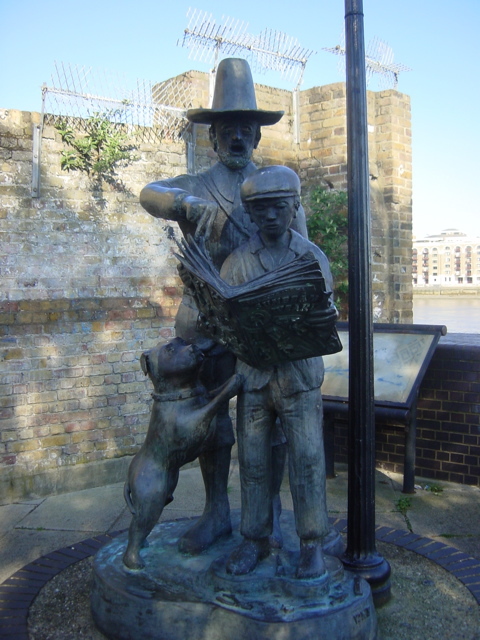 This Pilgrim statue is at the point where I had to come away from the riverfront for a bit. You'll see why there's a Pilgrim statue here in another couple of photos. 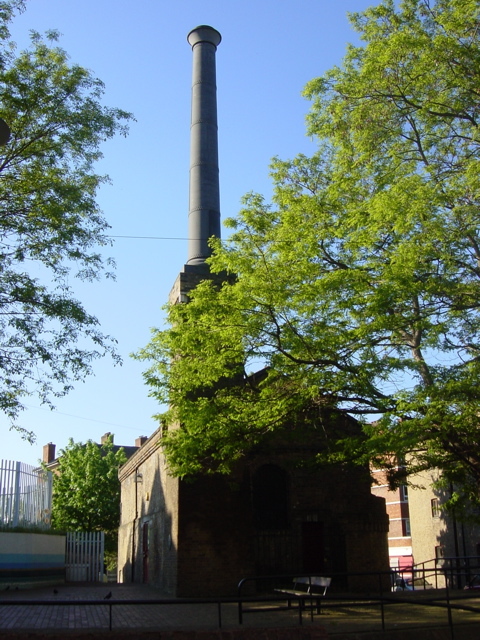 This is the little blue blob labelled "Brunel Engine House" on the map. 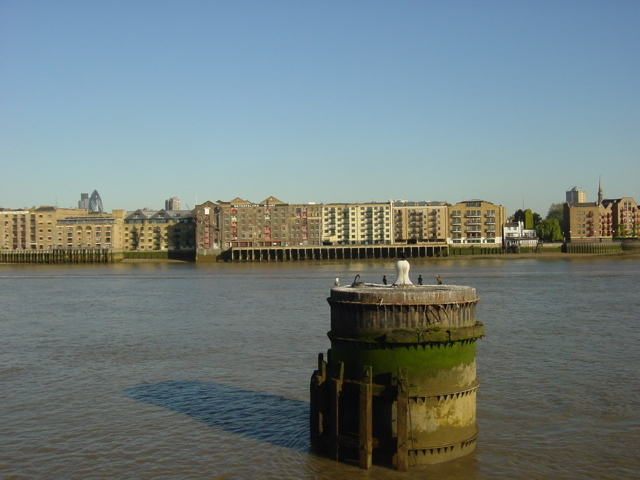 It's the pumping house for the Rotherhithe Tunnel, which was the first tunnel ever build under a navigable river. It's not the current Rotherhithe Tunnel, it's the one that is now used by the East London Line Underground service between Rotherhithe and Wappping. 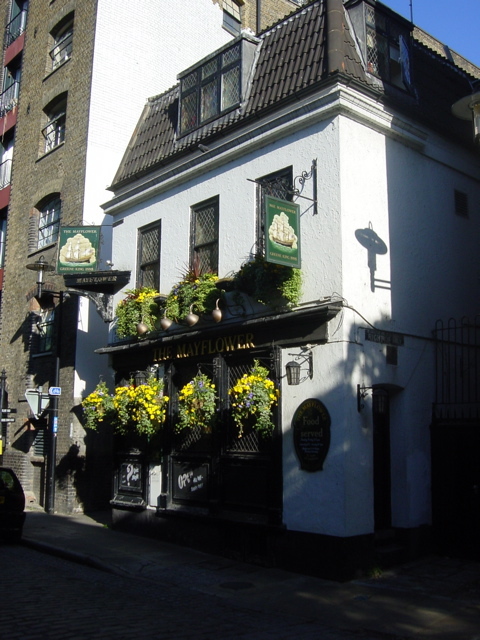 More or less across the road from it is the Mayflower pub. It's so named because it is pretty much exactly where the Mayflower set sail for North America, and it was there at the time although it was called the Spread Eagle then. My first view of Tower Bridge. And I was rather surprised by the immensely large cruise liner moored just downstream of it, which turned out to be the Nautica Blue Dream. King Edward III's country retreat is not in very good shape these days, as well as being less in the countryside than it used to be. 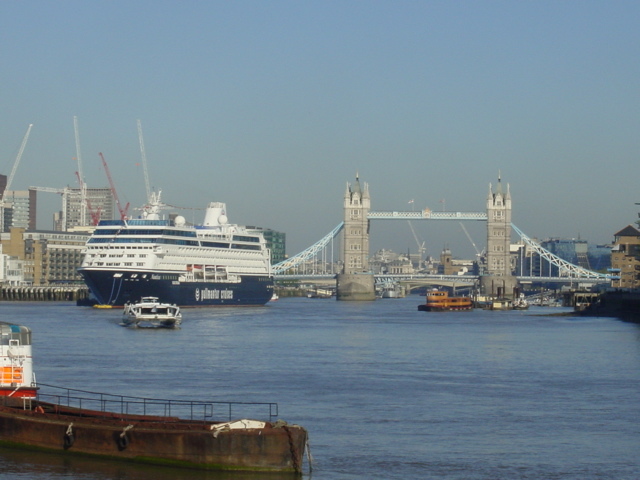 A closer shot of Tower Bridge (and the cruise ship), showing the City to the right. The left-hand one of the pair of tall buildings os Tower 42, commonly known as the NatWest Tower, although they sold it years ago. The right-hand one is the Swiss Re building, commonly known as the Gherkin. 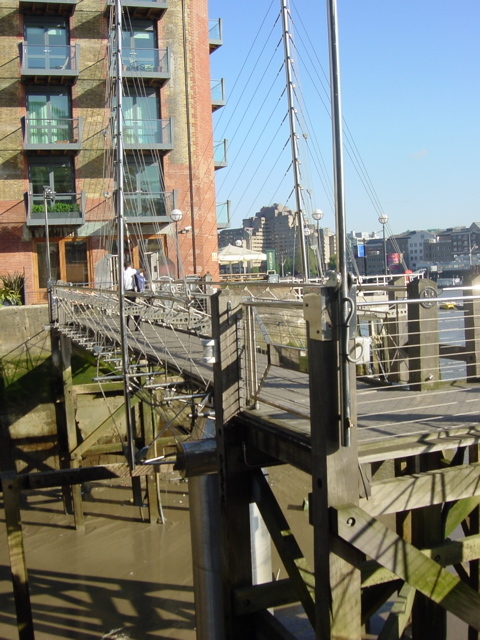 Here is the footbridge across St Saviour's Dock, which is the part of the map where I appear to walk on water as the bridge is not shown. 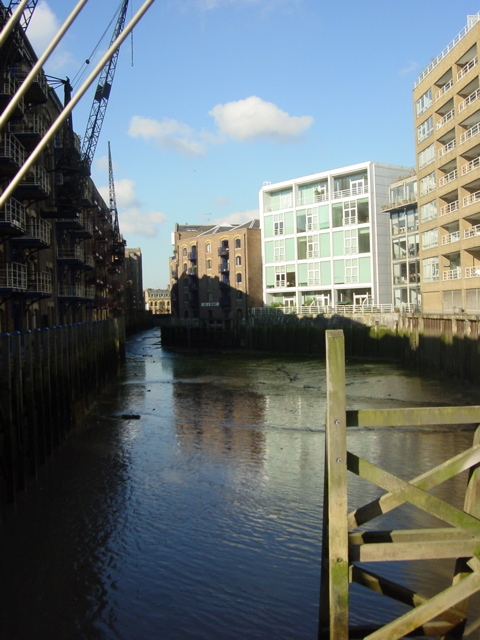 And here is the view up St Saviour's Dock from the footbridge. You can see that it would be a long way to walk round. The Design Museum has an outdoor exhibit -- I'm not exactly sure what it is. 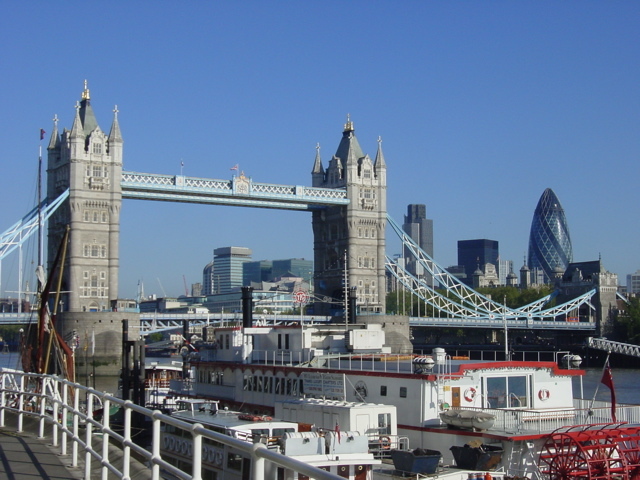 One more shot of Tower Bridge and the City. 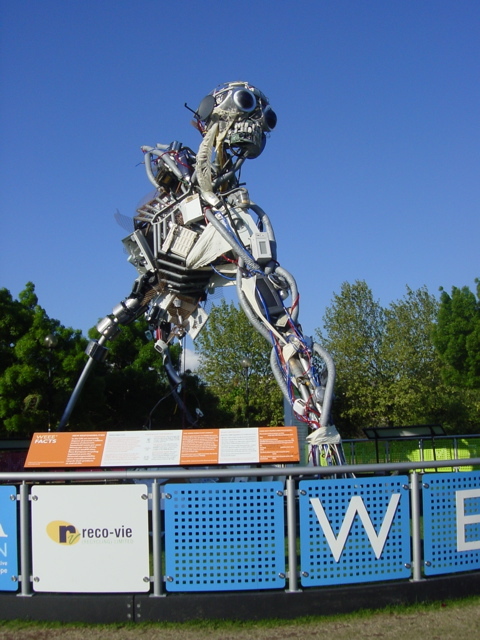 This may be the only sculpture ever constructed in honour of an EU Directive -- the WEEE (Waste Electrical and Electronic Equipment) Directive. Ken Livingstone's glass testicle. 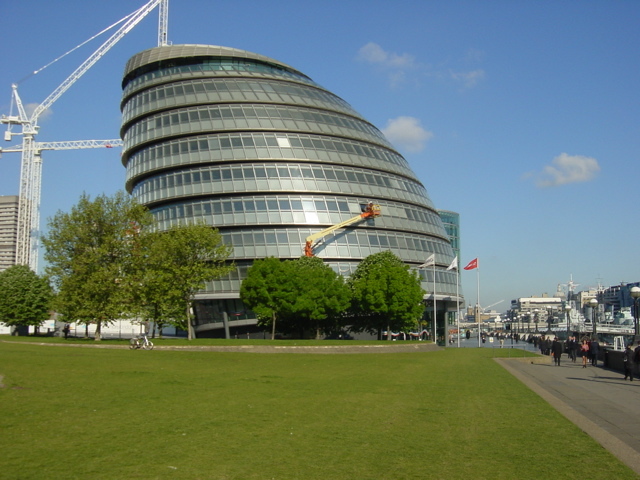 OK, it's the new Greater London Assembly building. 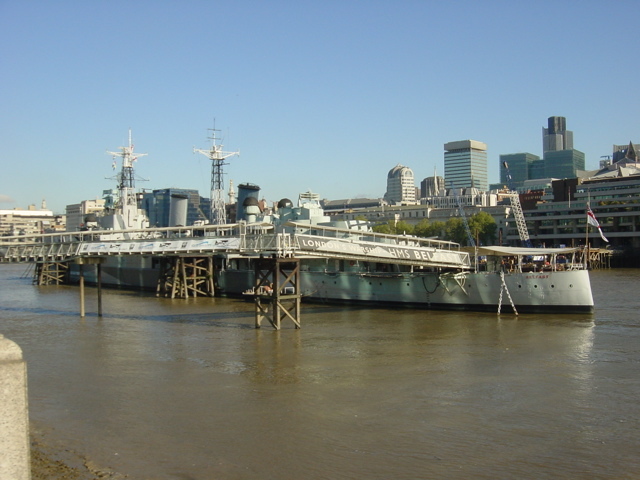 HMS Belfast, the UK's only surviving WW2 warship, now a museum. 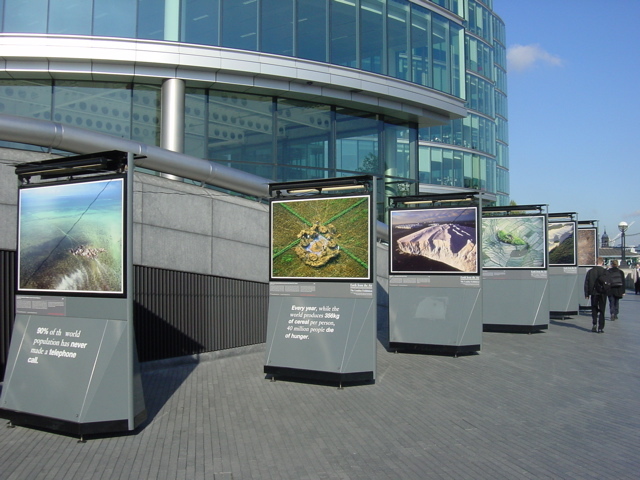 There's an exhibition of aerial photos outside the GLA building. 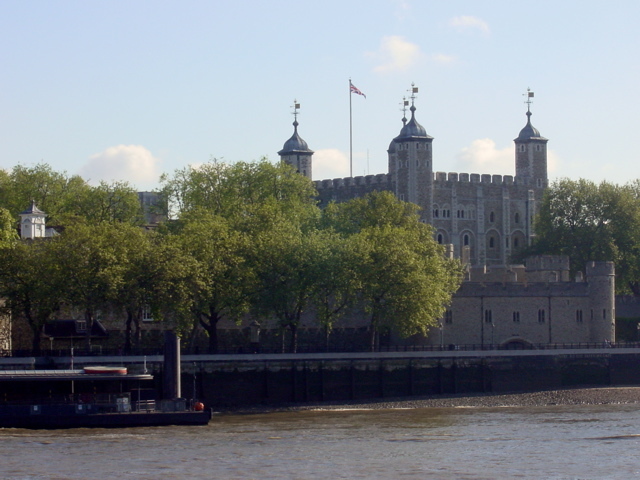 Looking back a bit at the Tower of London, which is slightly older than the GLA building. 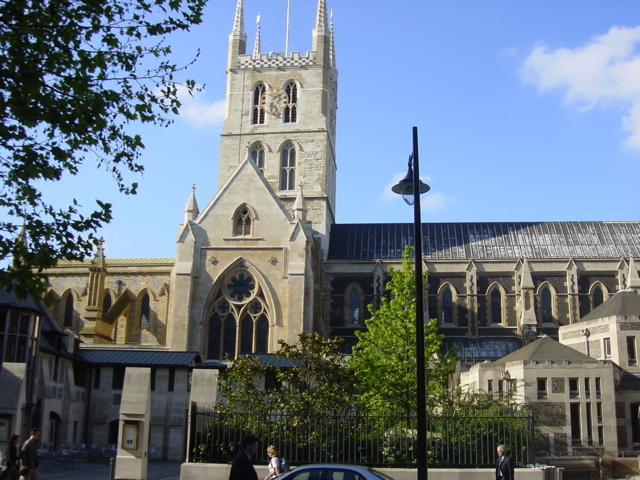 Southwark Cathedral is not as interesting as St Paul's, but it's the only cathedral on the south bank. 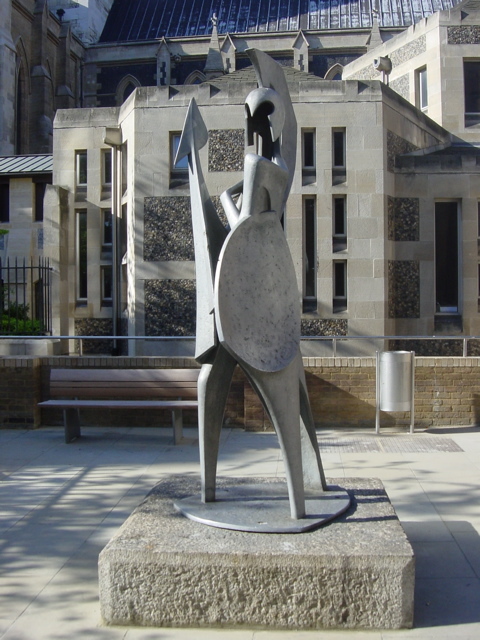 There's a rather modern-looking Roman soldier outside. 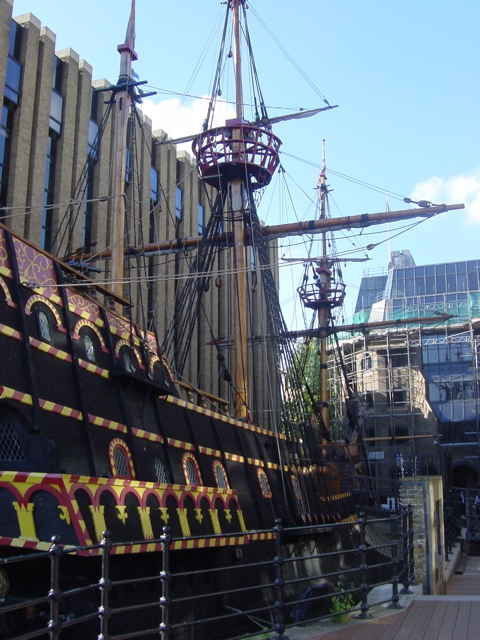 The Golden Hinde, Sir Francis Drake's ship, is moored in the little dock that the path veers around. It's a replica, sadly, but it has sailed round the world. 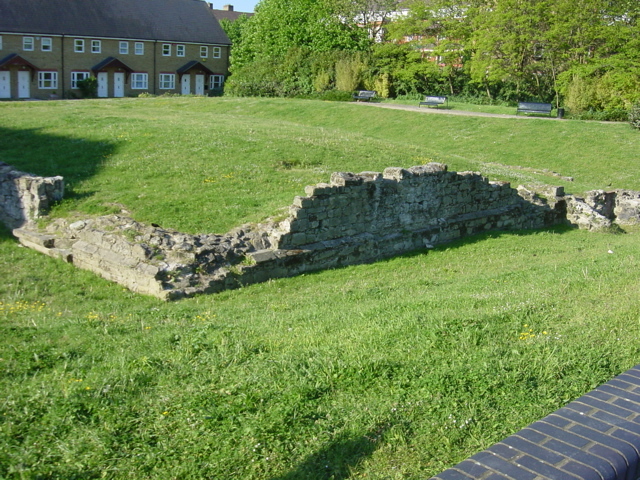 This is all that is left of Winchester Palace, which used to be the London residence of the Bishop of Winchester. 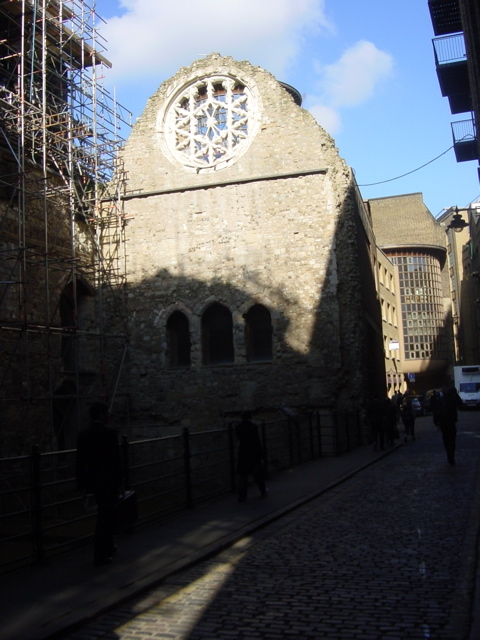 The first Clink Prison was in its cellar. 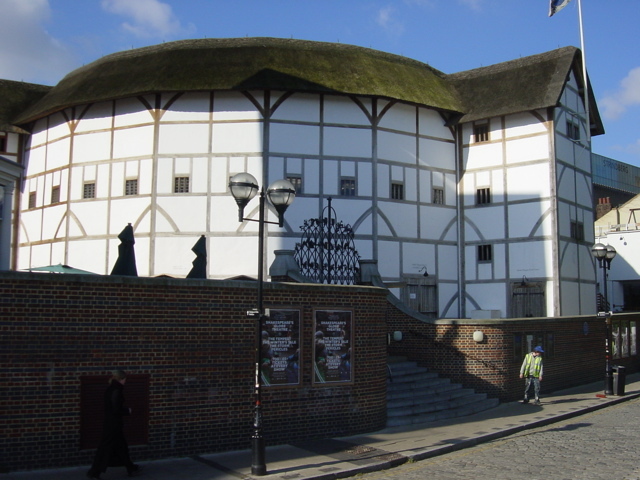 The Globe Theatre is also a replica of course, but like the Golden Hinde it's fully functional. 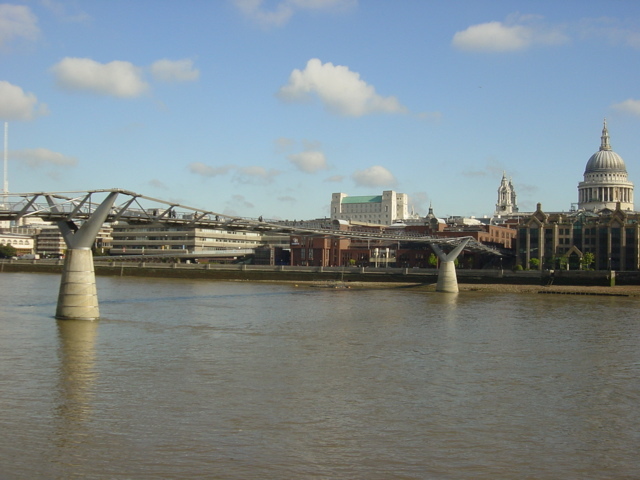 The infamous wobbly bridge from Tate Modern to St Paul's, which is wobbly no more. 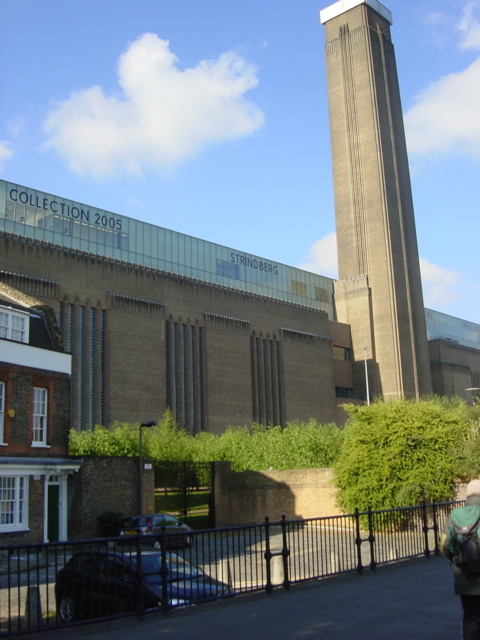 And here is Tate Modern, formerly Bankside power station. 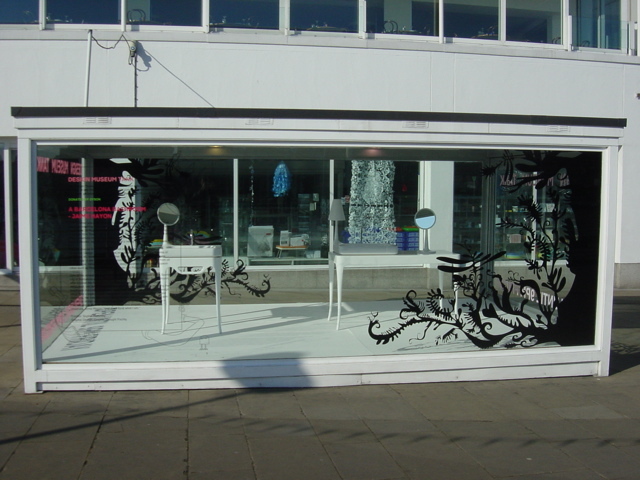 No outdoor exhibits at present, alas. 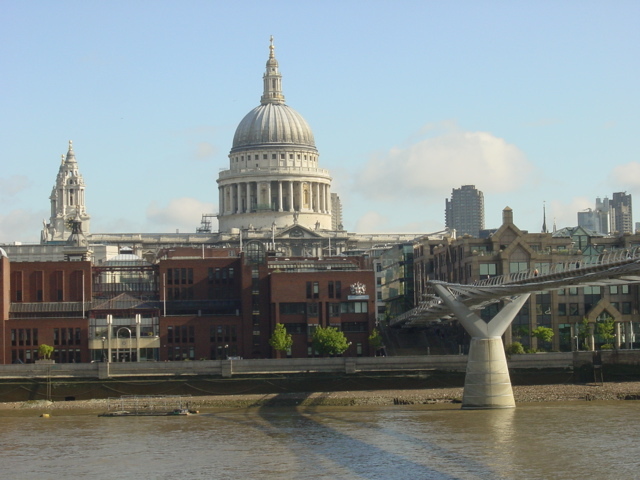 This is about the best view of St Paul's available from south of the river. Blackfriars road bridge to the left and railway bridge to the right. 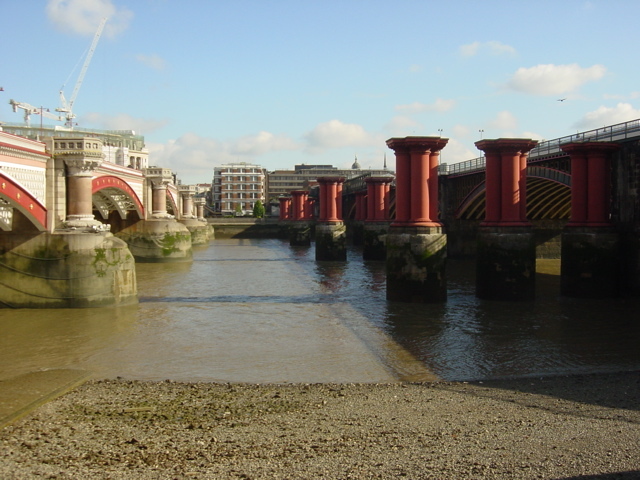 The useless pillars are from the old Blackfriars railway bridge -- it would have been too expensive to remove them. I didn't take photos of the various 60s concrete buildings like the National theatre, Hayward Gallery and Royal Festival Hall. Aren't you glad? 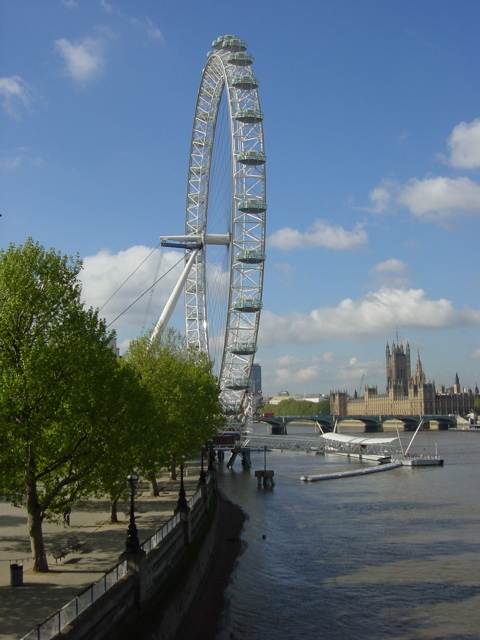 Here is the London Eye from the new Hungerford footbridge. And here's the view upriver from further along the bridge. 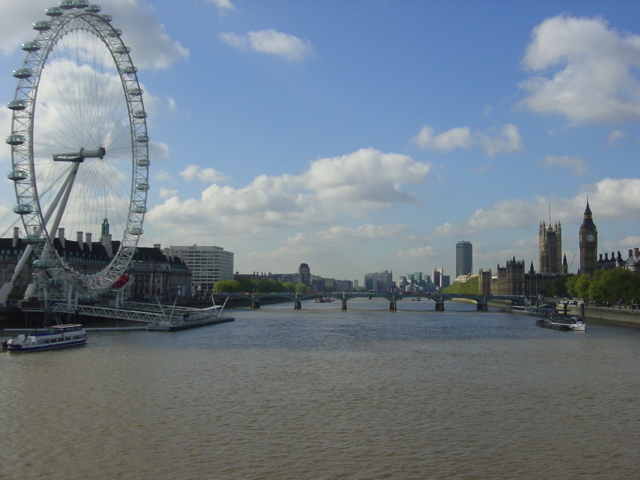 London Eye, County Hall, Westminster Bridge, Houses of Parliament, Big Ben, etc. 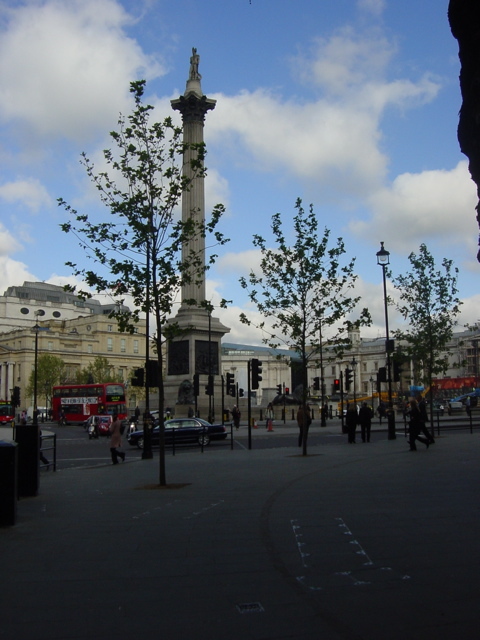 Moving across the river, here is Nelson's Column. 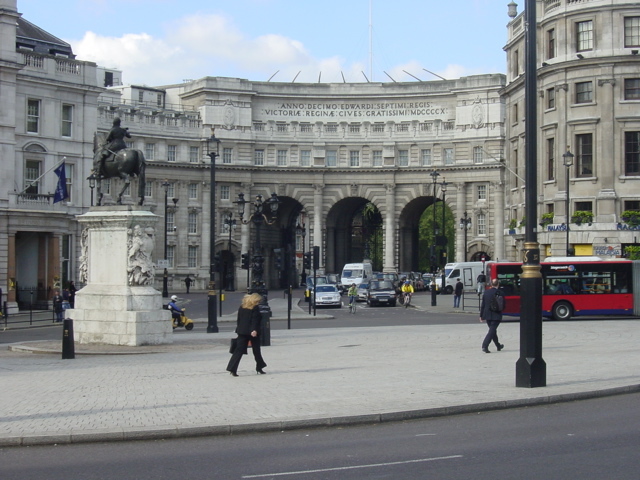 Admiralty Arch, at the entrance to the Mall. 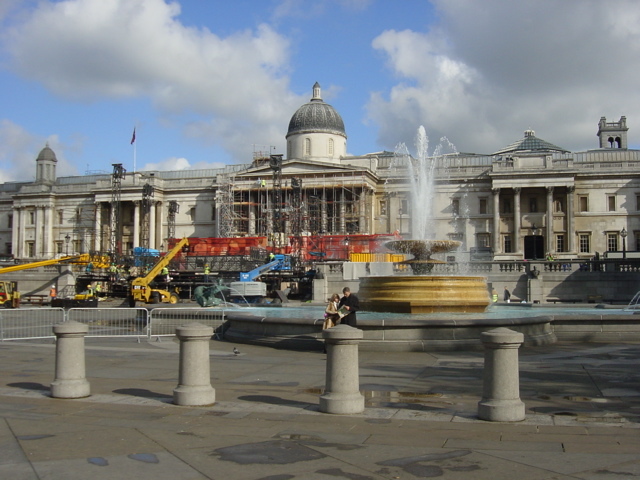 The view across Trafalgar Square to the National Gallery -- unfortunately, they're busy setting up for a concert on Saturday. 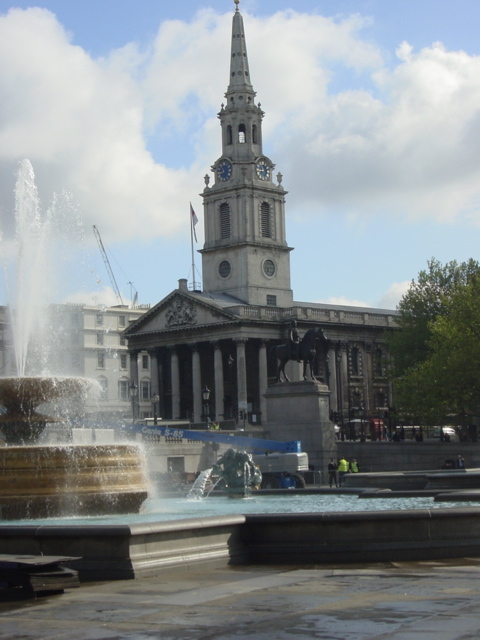 St Martins in the Fields. No fields any more. 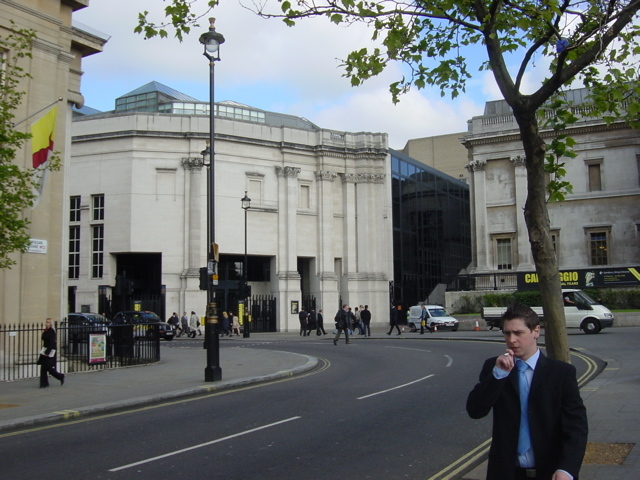 The Sainsbury Wing of the National Gallery, famously described by Prince Charles as a "monstrous carbuncle". 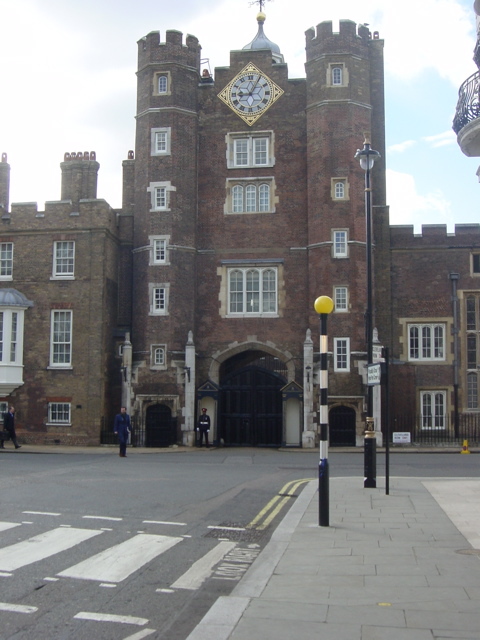 St James's Palace, much older than Buckingham Palace.